JD Power's annual ratings put Apple on top with an 811, beating the industry average of 765. What's surprising is that only Apple and LG are above the average, whereas everyone else is below. What's not surprising is that Motorola is dead last. Up until their Android Cliq they really didn't have much going for them—and neither did Palm, until their Pre. 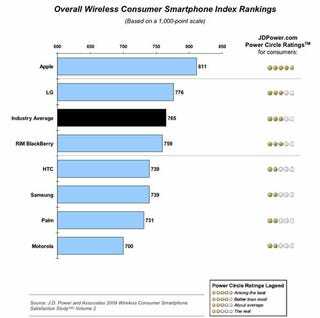 So our guess is that these ratings will look a little different next year with Palm moving up a slot or two, and Motorola pulling out of the shame spot. Motorola doesn't do too bad on the dumbphone ratings, on the other hand.